This study was conducted in eight different regions of Saudi Arabia to estimate monthly and annual crop water requirements (CWR). Fields that have been selected are located in regions of the Medina (Al Ula), Tabuk (Teimaa), Makkah (Al Jumum), Al Jouf (Sakakah), Riyadh (Sodos), Qassim (Riyad Al Khabra), Hail (AL Kaedh), and East Region (Al Ahsa). The determination of CWRs was based on Penman Monteith method, field water balance, actual water applied in each field, and actual water applied by farmers in adjacent fields. The results based on Penman–Monteith method showed that the crop evapotranspiration, ETc (mm/year) of the sites in, Medina, Tabuk, Makkah, Al Jouf, Riyadh, Qassim, Hail, and East Region were 2418.75, 1940.51, 1837.76, 2259.03, 2139.23, 2207.41, 2008.23, and 2144.87 mm/year, respectively. The CWRs (m3/ha) after taking into account the proportion of cultivated area for each tree were: 9495.24, 7340.18, 7298.93, 8913.59, 8614.96, 8568.68, 7996.99, and 8510.72 m3/ha, respectively. The average date palm numbers were 100 trees/ha. The total annual CWRs (m3/tree) in these sites were 95, 73.4, 73, 89, 86, 85.7, 80, and 85 m3, respectively, as the radius of shaded area per tree is 3.5 m with an effective diameter of 90%, and the rate of leaching was 12, 8, 13, 12, 14, 11, 13, and 13%, respectively. The average overall irrigation water requirements was 8342.41 m3/ha/year (1 ha. = 100 trees). The results of water balance method showed that the water consumed for Qassim and Al Jouf was 3604.31 and 3515.25 m3/ha/year, respectively. The actual irrigation water added by a flow meter for all study sites was 11,305.0, 9463.9, 9692.0, 11,252.75, 1007.40, 10,035.0, 10,272.5, and 10,082.8 m3/ha/year, respectively, while these amounts added by the farmers in adjacent fields were 13,717, 12,277, 12,220, 13,340, 12,050, 12,880, 12,620, and 12,610 m3/ha/year, respectively. The agricultural expansion of date palm in Saudi Arabia faces huge challenges, which are typical of dry regions characterized with water scarcity, low rainfall and high evapotranspiration demand. Most of irrigation water is obtained from groundwater storage. The agricultural sector consumed more than 85% of water consumption, which reached more than 23 billion m3 in 2012 (Ministry of Electricity and Water 2014). Due to the increases of water demand, an effective and accurate evaluation of crop water requirement (CWR) is essential for planning, designing, operating, managing farm irrigation systems. Accurate estimation of CWR can help to maintain efficient use of water resources for irrigation. Evapotranspiration (ET) plays a major role in irrigation water management (Allen et al. 1998). They reported that many factors may play a role in limiting crop development; these are water availability, soil salinity, poor land fertility, poor soil and water management, plant density, and soil water contents. In Saudi Arabia, the limiting factor in agricultural development is water availability to irrigate the increasing number of date palm tree. Based on the recent statistical reports (General Authority for Statistics, 2015), the total number of date palm trees is 28.5 million on 54,000 ha drip irrigation and 53,200 ha surface irrigation fields. For date palm ET estimation, the early work done by Furr and Armstrong (1956) estimated the annual ET to be 1300–1600 mm, as reported by an excellent review on date palm water requirements (Carr 2012). In Saudi Arabia, estimation of water requirement of date palm has been reported by many researchers. These estimates differ between 6200 and 55,000 m3/ha. Alazba (2001) estimates water requirement to be between 15,000 and 55,000 m3/ha, depending on irrigation system or leaching requirement. Al-Ghobari (2000) has estimated the total annual amount of water required by one date palm tree as 136 m3 in Najran of south western region. Estimates of Alazba (2004) for the actual annual water use per one date palm tree were 137 m3 in Eastern region to about 195 m3 in the central region for flood irrigation, compared to 55 m3 and 78 m3/tree for the two regions using drip irrigation, respectively. Kassem (2007) monitored water requirements in Qassim region, using soil water balance method, and he determined the annual water use with drip irrigation as 16,400 m3/ha, with a density of 100 tree/ha. Al-Amoud et al. (2012) estimated the actual water use in the range between 21,360 and 28,290 m3/ha, for density of 100 tree/ha. In study conducted in the western part of Saudi Arabia, Ismail et al. (2014) calculated water requirement based on Penman–Monteith for ETo, Kc ranged from 0.8 and 1.0, and the evapotranspiration area (23 m2/tree), to be 7300 m3/ha, for density of 100 tree/ha. Recently, Dewidar et al. (2015) estimated water requirement of date palm using non-weighing lysimeter. They reported that volumetric palm water requirement per day fell between 87 and 297 L/day, with daily average of 182 L, and crop coefficient ranged from 0.74 to 0.91. In Kuwait, date palm water requirement was determined using drainage-type lysimeters through water balance and ranged between 23,392 and 27,251 m3/ha. The Sentek (Sentek Sensor Technologies) multisensory capacitance probe (EnviroScan Diviner 200) was used to measure soil water content within and below the root zone in the soil profile (Bhat et al., 2012). Al-Ghobari and El Marazky (2013) evaluated the accuracy of three commonly used soil water sensor types (an EnviroSCAN IRR.4-8 probe, a Watermark 200SS sensor and a tensiometer, model R), to monitor volumetric soil water content (θv) and develop a means of improving irrigation scheduling; the results indicated that the tensiometers and Watermark sensors performed the best with the factory calibrations, with a RRMSE of 6.6, 7.6 and 8.5, and 8.6, 11.1 and 11.0%, respectively. In Algeria, Mihoub et al. (2015) reported that the annual water requirement is 17,411 m3/ha, for a density of 120 tree/ha by drip irrigation compared to 26,117 m3/ha of surface irrigation. In Jordan, Jordan valley, Mazahrih et al. (2012) reported that the amount of applied irrigation water per date palm tree was 27, 40, 53 and 67 m3 for the irrigation treatments 50, 75, 100 and 125% ETc, respectively. The aim of present study was to: determine the date palm water requirements of eight regions of Saudi Arabia taking in the consideration the shaded area of the tree and irrigation water quality, and compare date palm water requirements with the actual water added by farmers in the eight regions. This study was conducted in eight different regions of Saudi Arabia to estimate monthly and annual irrigation water requirements of date palm (Phoenix dactylifera L.) of Klayas variety. Field measurements and determination of ETc were taken during 1 year starting October 2013–September 2014 on complete grown tree (more than 10 years old). Fields that have been selected are located in regions of the Medina (Al Ula), Tabuk (Teimaa), Makkah (Al Jumum), Al Jouf (Sakakah), Riyadh (Sodos), Qassim (Riyad Al Khabra, Hail (AL Kaedh), and East Region (Al Ahsa) (Fig. 1). The geographical coordinates of each farm and characterization of the soil and irrigation water are shown in Tables 1 and 2. Small weather stations were installed in each site of the study to monitor the changes of meteorological data during the study periods. The meteorological data recorded were: net radiation (MJ/m2 per day), wind speed (m/h), air temperature (°C), relative humidity (%), and rainfall (mm). The air water vapour pressure deficit (kPa) was calculated using daily and hourly average temperatures and relative humidity. Finally, the reference evapotranspiration (ETr, mm/day) was calculated according to the Penman–Monteith (PM) equation as specified by the FAO protocol (Allen et al. 1998). where Kc = crop coefficient ranged from 0.8 to 1.0 depending on the month of year as noted in (Allen et al. 1998), ETr = ETo = Reference crop evapotranspiration (mm/day), ETc = Crop evapotranspiration (mm/day). where Se = the percentage of evapotranspiration area, R = radius of tree (m), and shaded area = area of the shade of one tree measured at noon. Leaching requirements were calculated using the following equation (Doorenbos and Pruitt 1977). where LR = the fraction of the water to be applied that passes through the entire root zone depth and percolates below. ECiw = electrical conductivity of irrigation water (dS/m). ECe = electrical conductivity of the soil saturation extract for a given crop appropriate to the tolerable degree of yield reduction (dS/m). Max ECe = maximum tolerable electrical conductivity of the soil saturation extract for a given crop (dS/m). Eff = leaching efficiency (90% for sandy and loamy sands). where GWR = gross water requirement (m3/ha), ETc = crop evapotranspiration (m3/ha), Effir = efficiency (%), 90%, LR = leaching requirements, and Se = the percentage of evapotranspiration area. The study site: The amount of applied irrigation water throughout the year was determined by recording the readings of flow meter (actually added) in the field experiment using soil moisture and data of meteorological stations. Farmers fields: The amount of applied irrigation water throughout the year was determined by recording readings of flow meter in adjacent farms (actually added to the fields by farmers adjacent to the field of study). The observed average values of the climatic variables in the eight sites are presented in Table 3. The data revealed that the highest maximum temperature during the year in the Makkah and East Region were 49.9 and 47.5 °C, while the lowest minimum temperature during the year in the Tabuk and Hail was − 3.3 and − 2.4 °C, respectively. The highest maximum net radiation during the year in the Medina and Al Jouf was 11.22 and 10.89 MJ/m2, while the lowest minimum net radiation during the year in the Al Jouf and Hail was 0.46 and 0.76 MJ/m2, respectively. The highest maximum relative humidity during the year in the Hail and Al Jouf was 95 and 92%, respectively, while the lowest minimum relative humidity during the year in the Al Jouf was 4%. The highest maximum wind speed during the year in the Al Jouf and Medina was 6.5 and 5.1 m/s, while the lowest minimum wind speed during the year in the Tabuk and Medina was 0.2 and 0.4 m/s, respectively. The results of the study showed that the crop evapotranspiration, ETc, (mm/year) of the sites in Medina, Tabuk, Makkah, Al Jouf, Riyadh, Qassim, Hail, and East Region was 2418.75, 1940.51, 1837.76, 2259.03, 2139.23, 2207.41, 2032.09, and 2144.87 mm/year, respectively. These results indicate that the estimation of ETc in different sites of Saudi Arabia is affected by weather conditions. The highest value of ETc was in Medina field site which is due to the highest net radiation and temperatures. The results of the study in Table 4 show that the irrigation water requirements (m3/ha) after taking into account the proportion of cultivated area for each tree of the sites in Medina, Tabuk, Makkah, Al Jouf, Riyadh, Qassim, Hail, and East Region were 9495.24, 7340.18, 7298.93, 8913.59, 8614.96, 8568.68, 7996.99, and 8510.72 m3/ha, respectively, with 100 palm trees/ha. The total annual irrigation water requirements (m3/tree) in these sites were 95, 73.4, 73, 89, 86, 85.7, 80, and 85 m3, respectively, as the radius of shaded area per tree is 3.5 m with effective diameter of 90%, and the rate of leaching was: 12, 8, 13, 12, 14, 11, 13, and 13%, respectively. Irrigation efficiency was 90% and found that the average overall irrigation water requirements in all sites were 8342.41 m3/ha/year with 100 (tree/ha). These values of ETc and CRW are attributed to the metrological conditions of each site. However, the reduction in the estimated CWR to an average of 8342 m3/ha compared to overall average of 20,000 m3/ha as reported by many researchers (Al-Amoud et al. 2012; Ismail et al. 2014; Mihoub et al. 2015; Dewidar et al. 2015) is mainly attributed to the percentage of vegetative cover or shaded area (Se) of the tree, as we calculated the Se values as (0.33) of the actual area of the tree. Therefore, the practice calculating crop water requirements based on a distance of 10 m × 10 m between trees in the farms of Saudi Arabia is not adequate in all sites. This area of 100 m2 for each tree usually overestimates the crop water requirements, and therefore, calculations of crop water requirements are shown to be based on actual vegetation (shaded) area that was found to be around 7 m × 7 m in our study. This practice will ensure higher vegetative cover in date palm farms and better estimates of actual crop water requirements. 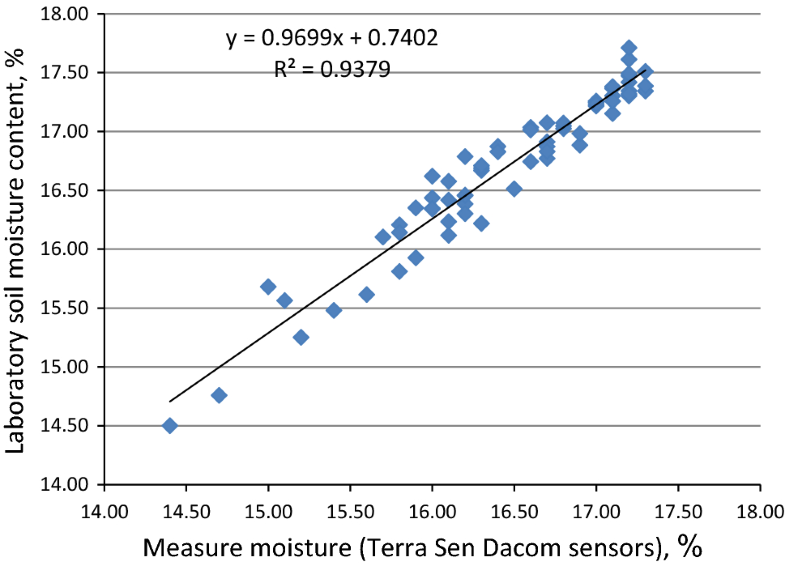 The results of water balance method showed that the relationship between the data of Terra Sen Dacom sensors and direct method (Gravimetric Method) in Fig. 2 for a period of 2 months for the three sites is a linear relationship with r2 = 0.90–0.93, and the results of Table 4 show that the water consumed is 3604.31 and 3515.25 m3/ha/year for Qassim and Al Jouf, respectively. The amount of rainfall for Qassim and Al Jouf during the season was 92.85 and 434.99 m3/ha/year, respectively. The water balance methods showed that water consumption for the two sites was very low compared to ETc estimation by PM method or water added to field. This reduction in total amount of water consumption is mainly due to short depth of the sensor installed in the site (120 cm). It seems that 50% of water added to date palm tree considered as leaching water. Table 4 shows that the amount of irrigation water actually added by a flow meter of all study sites of the Medina, Tabuk, Makkah, Al Jouf, Riyadh, Qassim, Hail, and East Region was 11,305.0, 9463.9, 9692.0, 11,252.75, 1007.4, 10,035.0, 10,272.5, and 10,082.8 m3/ha/year, while these amounts added by the farmers in adjacent farms was 13,717, 12,277, 12,220, 13,340, 12,050, 12,880, 12,620, and 12,610 m3/ha/year, respectively. The increases in the amount of irrigation in adjacent farms by the farmers are mainly due to poor knowledge on irrigation requirements. Before installing the system of monitoring irrigation water in the study sites, the farmers used to add three times this amount and it might reached 35,000 m3/ha. Table 5 shows that the productivity per hectare ranged between 5406 kg/ha in Makkah and 8400 kg/ha Al Ahsa, and water use efficiency of palm in Medina, Tabuk, Makkah, Al Jouf, Riyadh, Qassim, Hail, and East Region in study sites was 0.66, 0.66, 0.56, 0.55, 0.76, 0.67, 0.67, and 0.83 kg/m3, respectively, while in the neighbouring fields, these values were 0.54, 0.50, 0.44, 0.46, 0.62, 0.51, 0.53, and 0.68 kg/m3, respectively. The water saving was 17.58, 22.91, 20.69, 15.65, 16.95, 22.09, 18.60, and 20.04%, respectively. Based on the equation by Mass and Hoffman (1977) (Yield% = 100 − b(ECe–a), on the reduction of yield using saline water in all sites of the study. For the date palm tree, the threshold salinity values (a) of date palm are 4.0 dS/m and (b) as 3.6%. The results in Table 5 show that date palm production was affected by salinity in Al-Qassim site with a reduction 25% followed by East Region farm at 7.31%. All other areas were not affected by salinity. 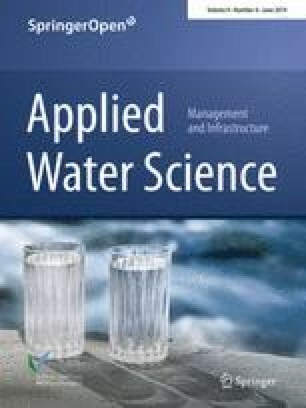 This study was conducted in eight different date palm regions of Saudi Arabia to estimate monthly and annual irrigation water requirements. The regions that have been selected are located in Medina (Al Ula), Tabuk (Teimaa), Makkah (Al Jumum), Al Jouf (Sakakah), Riyadh (Sodos), Qassim (Riyad Al Khabra, Hail (AL Kaedh), and East Region (Al Ahsa). The results of the study showed that the crop evapotranspiration, ETc (mm/year), without taking shaded area per tree of Medina, Tabuk, Al Jouf, Riyadh, Qassim, Hail, and Al Ahsa was 2418.75, 1940.51, 1837.76, 2259.03, 2139.23, 2207.41, 2032.09, and 2144.87 mm/year, respectively. The irrigation water requirements (m3/ha) after taking into account the proportion of cultivated area for each year are 9495.24, 7340.18, 7298.93, 8913.59, 8614.96, 8568.68, 7996.99, and 8510.72 m3/ha, respectively, 100 Palm/ha, and the annual total irrigation water requirements (m3/tree) in these regions were 95, 73.4, 73, 89, 86, 85.7, 80, and 85 m3, respectively, as the radius of shaded area per tree is 3.5 m. The decrease in the CRW in all sites of study to around 8000 m3/ha is mainly attributed to percentage of shaded area of date palm tree. Therefore, the practice of calculations of CRW based on a distance between trees to 10 m × 10 m should be changed to calculations based on actual vegetation area, which is an average of 7 m × 7 m in order to avoid overestimation of CRW of date palm trees. The water balance methods showed that water consumption for the two sites was very low compared to ETc estimation by PM method or water added to field. This reduction in total amount of water consumption is mainly due to short depth of the sensor installed in the site (120 cm). It seems that 50% of water added to date palm tree considered as leaching water. The authors wish to thank King Saud University, Deanship of Scientific Research, College of Food and Agriculture Science, Research Center, for supporting the research work.